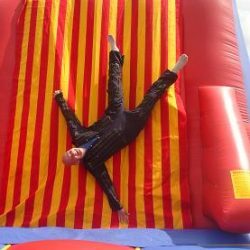 Wearing a trendy suit covered in Velcro see who can perform acrobatic jumps and launch themselves from an inflated bed and stick onto the Velcro wall. Stick yourself to our bar fly / human fly Wall. 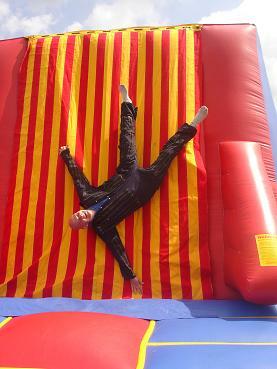 This Velcro Fly Wall is great fun for all ages, with suits to fit adults and children. You will be sure to fly so high. 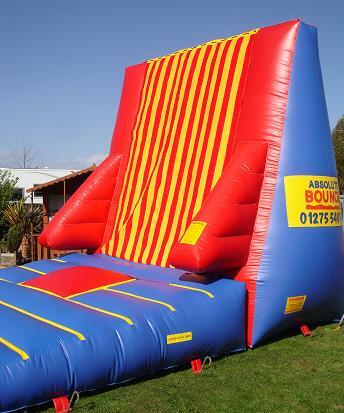 The aim is to jump onto the red pad then bounce up as high as you can onto the Velcro Wall. 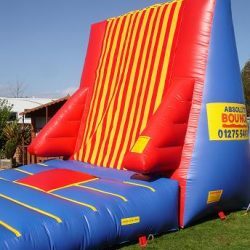 Great Fun For, Corporate Events, Fund Raisers, Schools,Hen Stag Nights,Youth Centres Village Fetes,Summer Parties and so much more. Don’t forget to check out our other amazing team building games and inflatables.